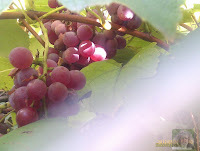 The Garage Foxey grapes: Are we ready? The nice perfumey smell of the IMBY grape vines has deteriorated a little bit like a decaying smell around the garage grapes! Looks like the bees and butterflys are in there sucking that sweet syrup from MY grapes and leaving just husks behind. The birds have tried to get in under the netting to a small degree this year, but not a lot. This is the usual time for harvest, going back to 1999 at least. The primary school has a Maypole and fete and my dad goes trout fishing at Eucumbene Dam with his brothers. I panic, worry and fumble around for the winery kit. Measure the sugar content, whinge about some diseases erupting in some bunches, scare off the ants. Only because, I suppose, my Shiraz crop failed completely due to mildew. 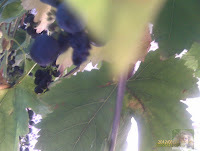 Anyway, there looks like a nice crop of garage grapes and maybe some Pinot Noir to throw in it. If it turns out okay, great, otherwise... Brandy or rum. At least a couple of bottles. Should have a home made wine made by this time next week.